If you don’t have your carpet professionally cleaned twice a year and rely solely on vacuuming to keep it clean, you’re in a serious trouble. Vacuum cleaners are unable to reach the base of your carpets and that’s exactly where all deadly bacteria, allergens and even fungi thrive. Call us if you want to melt the nasty iceberg. 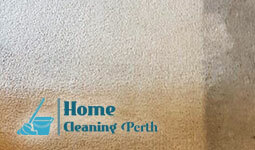 We offer professional carpet cleaning services exclusively in Perth throughout the week. Call us and we’ll make your carpet clean again. We’re preferred to other carpet cleaning companies in Perth, because we’re supplied with ultramodern cleaning tools and materials which promise better cleaning of your carpets. Included in our carpet cleaning services are moving of furniture if necessary, hoovering, deep steam cleaning – hot water extraction, but that’s not all. Forget all about walking on a damp carpet because we’ll extract 95 percent moisture from your carpet as soon as we finish cleaning it. We know how bad dirty carpets may smell, especially if you have domestic pets and that’s why we’ll also deodorize your carpets completely. What’s more, upon your request we can apply our professional SCOTCHGUAR Protector which makes the fabric stain resistant! Thus, you won’t freak out any time you spill something on it – it just won’t go through the fiber. Our carpet cleaning service is guaranteed, i.e., if we fail to deliver the best cleaning service we promise, we’ll come back and re-clean, free of charge. We can kill all bacteria, allergens and fungi rooted deep into the base of your carpet thanks to our modern cleaning techniques. We’ll make your dirty carpet shine bright again, just book our carpet cleaning services, applicable in Perth. Home Cleaning Perth © 2019. All Rights Reserved.